I finally broke into my cookbook stash to start my Cookbook Project for the year. Since we’re trying to eat better, Prevention’s Quick and Healthy Low-Fat Cooking featuring Pasta and Other Italian Favorites (whew!, what a mouthful!) seemed like an obvious starting point. I had steered away from this cookbook in the past because I feel like we do “Italian” a lot as it is but this book had a lot more than your standard spaghetti and lasagna. This recipe was a home-run and there is plenty of others I’m interested in trying, so this cookbook gets to stay on the shelf. We always end up doing the same vegetables for dinner, so this was a nice way to mix things up. I really liked them and Mark, who isn’t a zucchini fan – finished his too. Cut each zucchini lengthwise in half. Scoop out the pulp, leaving a shell. Reserve the pulp. In a medium frying pan over low heat, saute the onions and garlic in oil for one minute. Add the zucchini pulp, tomatoes, Italian seasoning, salt and pepper. Cook, stirring frequently, for 5 minutes or until the zucchini is tender. Spoon the filling into the zucchini shells. 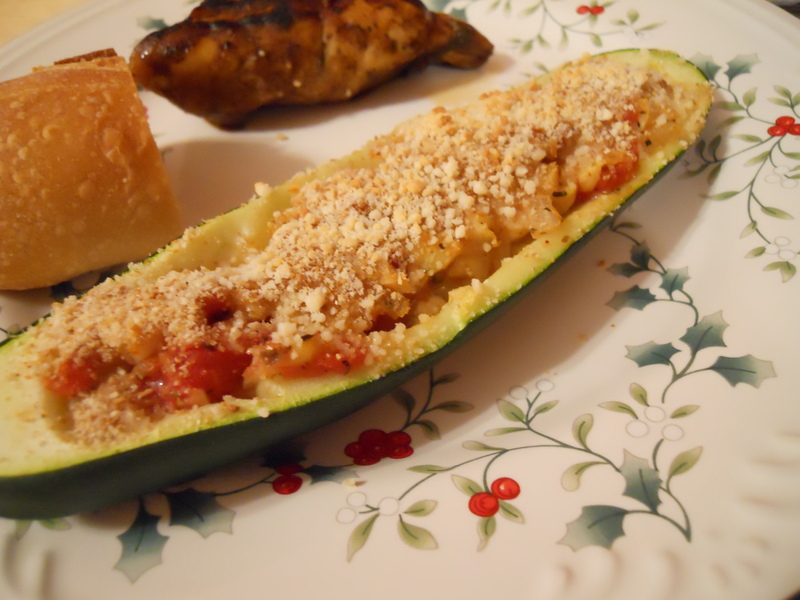 Sprinkle 1 T. bread crumbs and 1/2 T. parmesan cheese over each zucchini half. Place zucchini on a non-stick baking sheet and roast at 350F degrees for 15 minutes or until the zucchini are hot and the top is brown and bubbly. #ad Of all the packages we’ve unpacked for #brunchweek, this is the one Julie was most excited about! Thank you for the awesome cookbook, @dixie_crystals - we love it!